The Skinny: A cheap, messy, but enjoyable eighties HK flick. Based on a Japanese manga, this fantasy actioner concerns two split-at-birth monks who reunite to face off against the King of Hell. 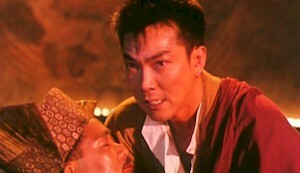 Yuen Biao is Peacock, who was raised in Tibet by Eddy Ko Hung. He journeys to Japan to find Ashura (Gloria Yip), who’s the daughter of the King of Hell and the key to the threatened Armageddon. While in Japan, he meets Lucky Fruit (Hiroshi Mikami), another monk who has the same mission. Yes, they’re long-lost brothers who must join forces to stop Ashura. However, Ashura turns out to be a sweet, nice girl (par for the course where Gloria Yip is concerned), so they decide to allow her to live.